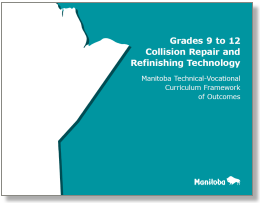 Two Manitoba trades contain the same common core Level 1– Automotive Painter and Motor Vehicle Body Repairer (Metal and Paint). The automotive Painter Unit to Course Comparison (UCC) Form also includes the common core for both trades. Manitoba Education and Training staff have completed this UCC Form to assist teachers in obtaining Level 1 accreditation with Apprenticeship Manitoba. Please note that the times in this document are estimates which meet the minimum time requirements established by Apprenticeship Manitoba. Teachers are invited to modify the times to reflect their individual programs.